The city of Erbil in northern Iraq is the seat of the Kurdistan Regional Government. Despite the tensions in the country, terrorist attacks are rare in the region, as the last major assault in Erbil took place in 2015 against the US Consulate. 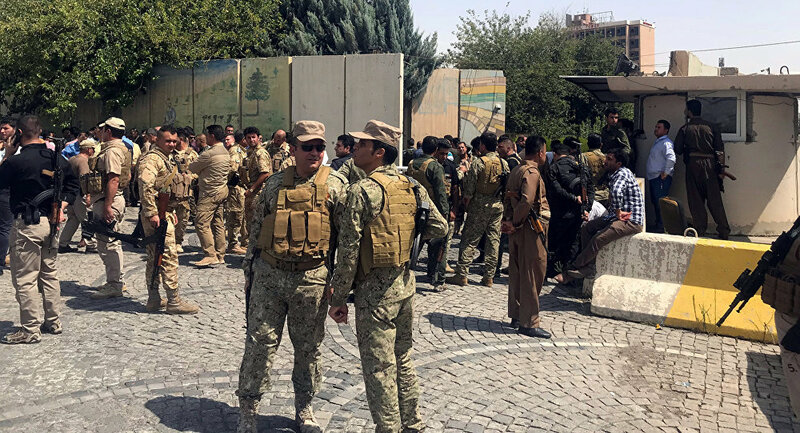 A group of militants opened fire in the Government building in the capital of the Kurdistan region in Iraq, seizing the third floor of the facility. "At around 7:45 a.m. two gunmen approached the entrance of the governorate and opened fire at the guards. They managed to enter and now they are on the third floor," said Erbil’s Deputy Governor, Tahir Abdullah. According to Abdullah, a policeman had been injured by the attackers. He also told Kurdistan 24 that the security forces had surrounded the building in order to find the gunmen. "The motive behind the attack is unclear," the official added. The reports specified that the group of attackers included three armed men. A few hours later Reuters reported, citing a security source that one of the militants had carried out a suicide bombing in a government building. There was no immediate data on casualties, but the report mentioned two policemen, injured by the assailants. — Mahmoud (@Mahmodshikhibra) 23 июля 2018 г. However, according to the network Al-Arabiya, the blast was a part of a Special Forces operation. The media outlet reported that the Kurdish soldiers had eliminated two attackers and freed two hostages in the building; one of them was critically wounded. After that the security forces announced they killed the third militant, ending the operation. According to the governor Nawzad Hadi, one worker was killed during the incident.